Visitors to Boston's Back Bay can still find a treasure-trove of period architecture and stately storefronts. Walk down Newbury Street to the corner of Dartmouth, for example, and here is an imposing structure in the Ruskin Gothic style, completed in 1878. Today, the building houses the prosaic-sounding Joe's American Bar & Grill with an interior reminiscent of a cross between a turn-of-the-century saloon and Durgan-Park. Yet let the observant eye wander over the exterior and a Victorian history in stone is revealed -- fish-scale slate shingles, both a Mansard and conical roof, a turret top, even dormer gables. Look again and you'll see a decorative sunflower carving, bay windows and a red brick facade that bespeaks volumes of craftsman artistry from yesteryear, if not various episodes of PBS' "This Old House." 277 Dartmouth Street in Boston's Back Bay is home to Joe's American Bar & Grill. Advanced Construction. was invited to join a team of restoration specialists on this job. The consortium now includes staff from Boston's Preservation Technology Associates, Skylight Studios, Building Envelope and the Back Bay Architectural Commission. Along with masonry contractor Mike DeBlasio, Advanced Construction was assigned to renovate, restore and repair this property, with particular emphasis on restoring the brick exterior, the claret color of which in the late afternoon autumn sun reflects a warm glow suggestive of Warsaw or Dublin. Furthermore, the sandstone facade has long shown evidence of deterioration due to age, weather and pollution. Thus the sculptural enrichment of the sandstone was especially challenging. Robert Shure of Skylight Studios in Woburn handled the reproduction of the sandstone detail, eliminating the need to solicit out-of-state quarry imports. He used remnants of the existing ornament to resculpt in clay the deteriorated ornament. This was then molded and recast in cast stone. Skylight Studios, Inc. has worked extensively on the ornamental restoration of many historic buildings including the Old State House in Boston and the Washington Monument, in Washington, DC. As a collaborative effort, this historical renovation required a good deal of consultations high above traffic on Newbury and Dartmouth. Far above the madding crowd, we've been replacing lead-coated copper flashings at the copings of gable parapets. Another task was repairing stone damage attributable to steel corrosion. As steel expands, the inside volume of stone tends to crack, in a process called "oxide jacking." This requires the removal of existing steel and its replacement with waterproof and stainless hardware. So next time you're in the neighborhood of Newbury, stop by and review the Victorian restoration. 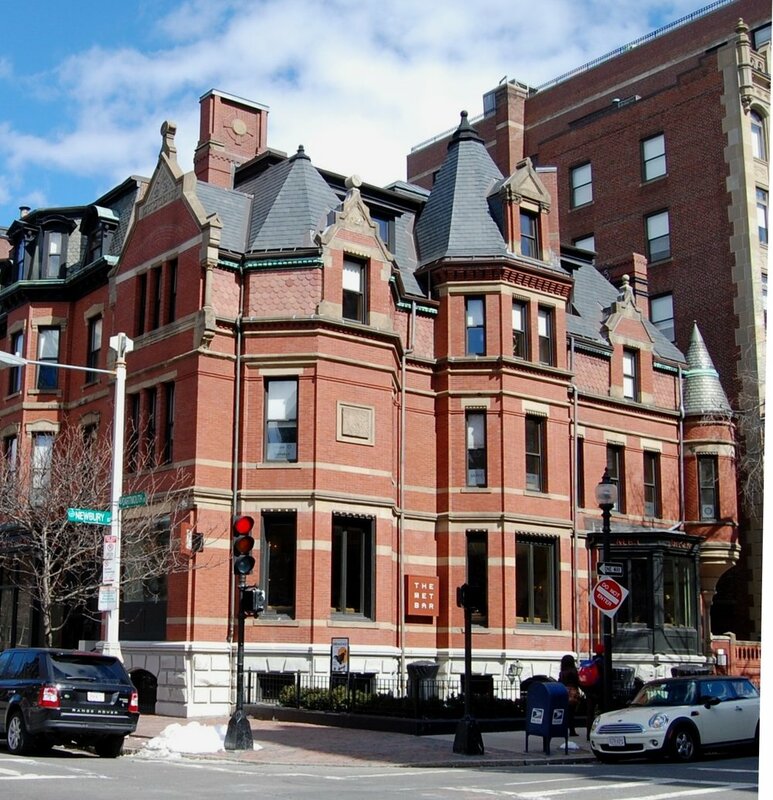 On the other hand, if you have an old brownstone, office space or historical property that requires patient care and handling, done in an unobtrusive and efficient manner, consider Advance Construction, conveniently situated on Newbury Street, Boston.